RPG is crucial for treatment of TOS. Treatment of TOS should always begin with conventional therapy consisting of addressing underlying postural and repetitive use conditions. During the RPG basic course this syndrome is being considered along with other cervical-brachial pains. Etiologically, three main causes of true neurogenic TOS can be identified. Structural abnormalities are identified in all cases and include anatomical variants of osseus, fibrous and fibro-muscular structures. Post-traumatic TOS can result from the loss of costoclavicular space as a result of damage or secondary to central sensitization or trauma-induced fibrosis. 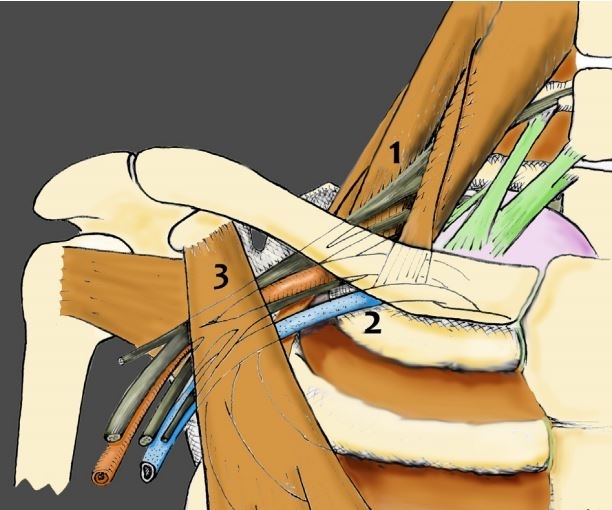 Lastly, acquired cases tend to be associated with repetitive overuse and postural dysfunction resulting in intermittent nerve compression at the thoracic outlet and/ or double-crush syndromes. Diagnosing true (neurogenic) TOS is by the presence of muscle atrophy and wasting in the lateral thenar musculature in conjunction with associated pain in the medial aspect of the upper limb.